Bison is becoming recognized as a healthy alternative to beef as it is a leaner meat with similar taste and texture to beef. Bison is touted as having a strong flavor, so you might be able to serve less bison per serving compared to beef. While beef and bison are comparable in certain ways, bison comes out ahead when it comes to nutrition. Although it is more expensive than beef, consider bison the next time you want a steak. Bison contains considerably less fat than beef. A 3.5 oz. serving of bison contains 2.42 g of fat while the same size of choice beef has 18.54 g and select beef has 8.09 g. Of the total fat in beef, 46.3 percent of it is saturated fat while 43.4 percent of the total fat in bison meat is saturated fat. Both beef and bison also contain heart-healthy fats. 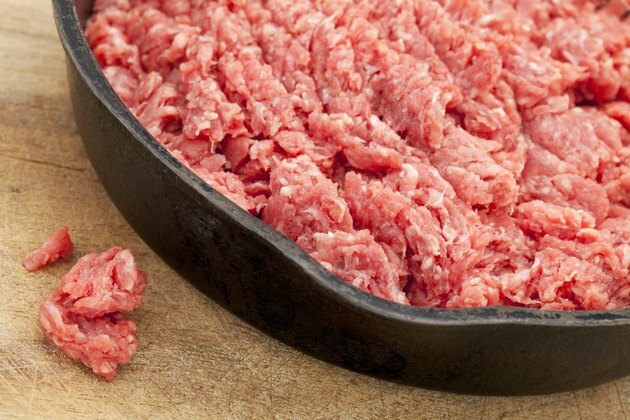 Of the total fat in beef, 8.2 percent is polyunsaturated fat and 45.5 percent is monounsaturated fat. Compared to bison, 11.7 percent of a bison's fat is polyunsaturated fat and 45.1 percent is monounsaturated fat. Bison meat also contains fewer calories than beef. A 3.5 oz. serving of bison has 143 calories compared to 283 in the same serving size of choice beef and 201 in select beef. These meats are similar in cholesterol levels, although bison has a little less with 82 mg compared to choice beef's 87 mg and select beef's 86. While containing lower quantities of nutrients you want to limit, bison also contains higher levels of nutrients you need in large amounts. The 3.5 oz. serving size of bison has 3.42 mg of iron, whereas choice beef has 2.72 mg and select beef contains 2.99 mg. Bison has 2.86 mcg of vitamin B-12 compared to the 2.50 mcg in choice beef and 2.64 mcg in select beef. For protein, bison has 28.44 g, choice beef contains 27.21 g and select beef has 29.89 g.
Another consideration is the way bison and beef cattle are raised and how the meat is processed. Bison are grass-fed, allowed to roam, and are not given hormones, antibiotics and other chemicals. Beef varies widely in terms of these issues. The USDA explains that cattle eat grass during the beginning of their lives, from where three-quarters of them are brought to feedlots and given feed that contains grains. Antibiotics and hormones can be given to cattle, but it depends on the company and type as to how the cattle and meat are treated. Bison are not graded by the USDA, and inspection is voluntary, whereas inspection is mandatory for beef and grading is voluntary.